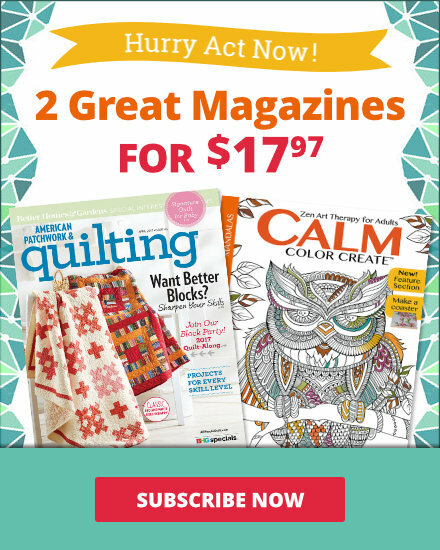 See the featured quilts and web-exclusive color options and projects from the American Patchwork & Quilting December 2014 issue. 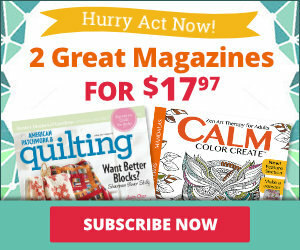 The December 2014 issue of American Patchwork & Quilting is on sale from October 7--December 2. 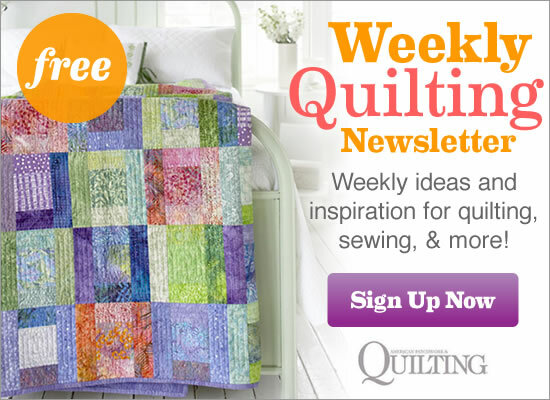 Designer Jean Wells shares the path her quilting life has taken over the past 45 years. Using one triangle template and simple quilting motifs, designer Vanessa created stockings with pieced fronts. They are perfect for containing small gifts or enhancing your seasonal decor. Make a gift of wine or other food item more memorable by creating pretty fabric packaging. Designer Joyce fussy-cut some of the wine carriers’ decorative fronts from a panel print. Who hasn’t been tempted by little packets of precut 2-1/2" squares? Designer Jennifer used them with just a bit of rickrack to embellish sweet tea towels. When your pincushion is on your wrist, it’s always handy! Designer Sachiko used a silk flower for the petals surrounding the puffy pincushion flower center. Designer Wenche crafted two-tone birds with simple embroidery stitches and a variety of ribbons and beads she’s collected. Cutting up a floral fabric allows a bit of rose to enhance the classic color combo of blue and cream. Make your stripes look twice as nice: Use them as a border and in the blocks. To give your eyes a happy resting place, pair the stripes with colorful solids. Give your big prints room to bloom. Surround them with a two-tone fabric that mirrors the background color to create faceted shapes. Use a cool-color palette sprinkled with metallic highlights to create a calming floral wall hanging that is subtle yet ornate. Elevate your table with decor featuring the textural dimension of double appliqué, a skinny flange, and extensive quilting. Triangles in two sizes are apparent on first glance at this throw. But a closer look reveals how the overall design is cleverly created from pieced and solid hexagons. Consistent color placement of the A pieces creates a design where the hexagonal blocks are more apparent. When assembling, sew together three identical side units around a large C triangle. Quilt tester Laura Boehnke also took the challenge out of choosing which fabric works best for each large triangle by using the same fabric for all of them. While bringing simplicity to the forefront, this color option also lets the hexagons shine as brightly as the triangles. An antique greeting card prompted a simple-to-sew seasonal pillow. What’s better than squares? How about squares that form squares! In this quilt, a plethora of 1800s reproduction prints unite in a king-size Square-in-a-Square design. Use a breathtaking assortment of batiks in a Square-in-a-Square design. This wall hanging begins with warm colors in the center, then moves to cool colors around the outside for a final product that resembles a vibrant rainbow-color firework. Create a breath of fresh air when you combine florals of varying scale in an oh-so-easy throw. Use a diagonal setting to give a fresh twist to traditional blocks in a timeless color scheme. Fall in love with this wall hanging featuring pretty pastels and romantic florals. 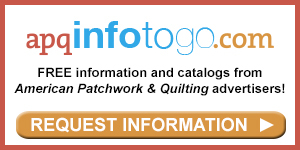 Scrappy 36-Patch blocks and strategic sashing jump off a cream quilt center. 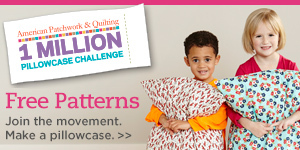 Try hand applique and embroidery on a folk art pillow. The goat's spots are perfect for showcasing beautiful stitches. Get instructions for the stitches here.